A lot of people want to be their own boss and look to become an entrepreneur. But not every business idea will succeed. There are many reasons why a small business can fail, but we wanted to share some top tips that will help your small business succeed. While many of these tips are quite common and make sense, many entrepreneurs don’t follow these kinds of tips and wonder why their start-up did not take off. No business is successful in one day. Actually, almost no businesses are successful even after one year. 1) Is the product or service you want to offer, something that people want and is there a market for it? Too often, people jump into a business built around a product or service they think will be successful, rather than one that is already proven to have a market. It is important that you do your market research before you invest your time and money into a start-up business venture. Just because you think your hobby will make a good business, does not mean that someone wants to buy your product or service. 2) Create a business plan and establish a budget to determine how much money you will have to work with. 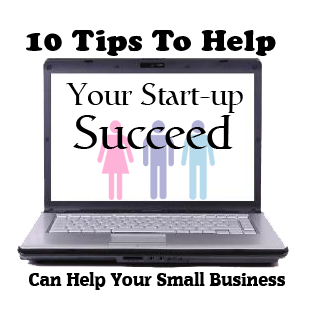 Figure out how much it will take to develop your product or service and bring it to market. Make a specific business plan that outlines the primary and secondary goals of your business. Part of your business plan is also creating a marketing plan, so that you have a working document of how you are going sell your product or service. 3) When you are starting your business, the most important thing is to get cash flow – the lifeblood of your small business. It is important that you find ways to jump-start your cash flow immediately. If your business is offering a professional service, never be afraid to ask the client for an up-front deposit before starting the job or project. The deposit will give you the cash flow to buy materials and the products that are needed to do the job, without having to go into your own pocket. 4) Many accountants will tell you, when starting a new business, to always overestimate expenses and underestimate revenues. This will go a long way in helping you plan your small business without any surprises. If you are able to do it with less expenses and more revenue, then that will encourage you to work harder on your start-up. 5) If there is a way to cut costs, find them. This should be something that you are always thinking about because every dime you save on expenses will help your cash flow. It does not take an accountant to tell you that all the cash flow in the world is worthless if it is not positive cash flow. Basically, your small business has to bring in more cash than you need to pay out. 6) Learn to be a salesperson and never underestimate how important it is to be able to sell. In business, nothing happens until a sale is made. Even if you never have to sell directly to clients, you will have to sell your ideas to investors, or sell consumers or customers on your brand. Selling is absolutely critical to your success. If you have an aversion to selling, you must try to get over that. 7) As a business owner, you need to be a leader, not a follower. That means trusting an inner compass to guide you when there are no outside indications as to what step to take next. It means taking control and having people rely on you. 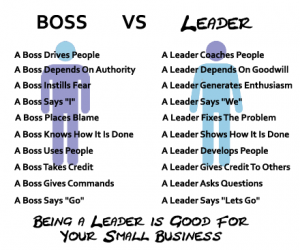 Being a leader and being a boss are two very different things. 8) Never discount for the sake of making a sale; add value to your offering instead. Whenever you discount, you are taking money directly out of your business and directly from your bottom-line profit. Why would you want to do that? Instead, create added value propositions up and down your product or service line, so your client or customer will see the value in what you are offering. 9) Under-promise and over-deliver. Once you land a new client, be sure to go above and beyond their expectations for at least the first few months. This will give your client or customer a good feeling and even get you some referrals on other jobs. Be careful not to go too far with this, or the client will expect this type of service all the time – and they may not be happy when you don’t deliver when you promise. 10) If you do not need an office and you plan on running your small business out of your home, then the cost savings on leasing traditional raw office space will help your bottom line. But you also want to protect your privacy and not have business mail coming to your home address. So consider a virtual office situation at a office business centre. This looks more professional than a P.O. Box – and when you do need an office, they can rent you a service office without a long-term lease. More importantly, when you do move in, you do not need to change your business address.